Hi all, iz Pigeon here. I iz here to talk about my adventure lately. My goggies loves riding in cars, but Pigeons do NOTS like. It'z never good when Momma breaks out da car box. Where iz you taking me, kerazy Momma?? You knowz what's even worse? When she takes you OUT of da car box and you iz at the place where they pokes and prods and sticks you everywhere. Can you believes they made me gets on a SCALE?? A lady never revealz her weight! Then they stoles my blood and trimmed my claws. Dey not coming back, are dey, Momma? Oh Momma. It wuz awful. And dey are NEVER satisfied! Dey want to see me in another month because they sez I iz losing weight and have some weird liver thingies in my bloods. So MORE blood tests and stuffs. Ugh. Car rides NEVER lead to anything good, I don' care what my goggies say. And family means CUTENESS!! 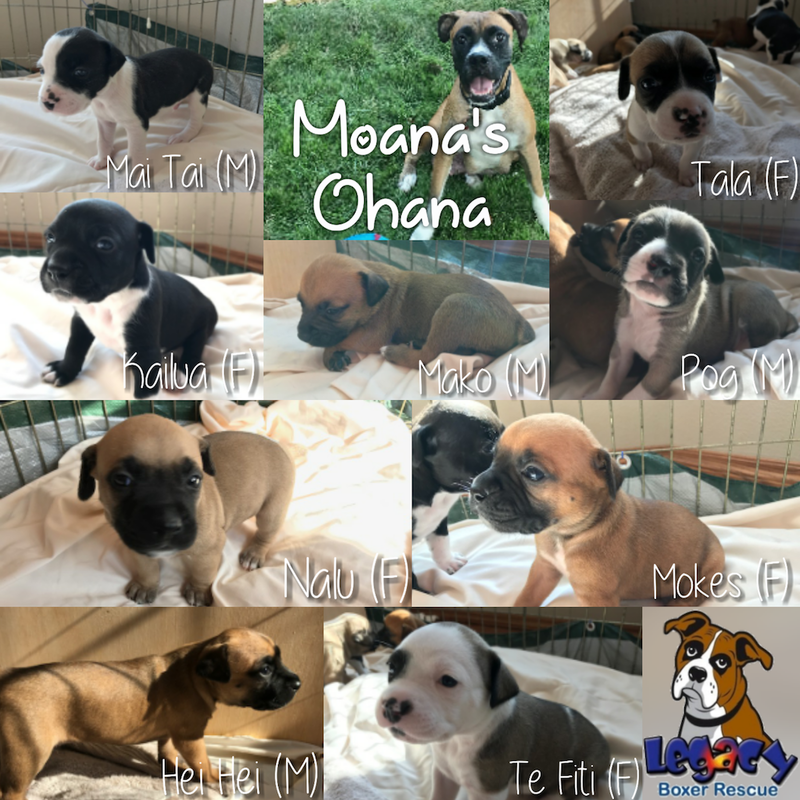 Take a look at Moana's Ohana, now 4 weeks old! Little Te Fiti is my favorite! Jessie loves Nalu. Wowee, what a grrreat picnic this is!!! We are having so much funs -- and we are STUFFED from Abby's catering truck. Let your food settle a little, then wander out to the edge of the park, where Jessie and I have set up a whole bunch of BOUNCEY HOUSES for everyone to play in!! 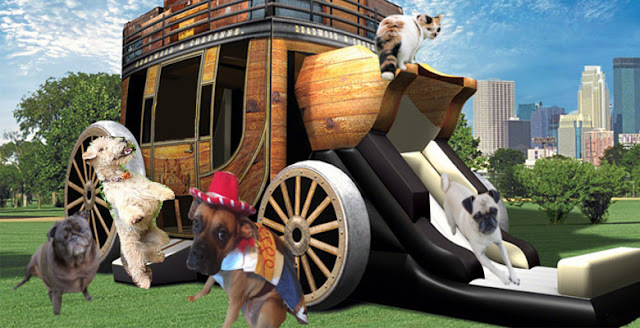 Jessie was the one who wanted to host this event, so she dug up a VERY special bounce house to share with some of her favorite cowpokes. 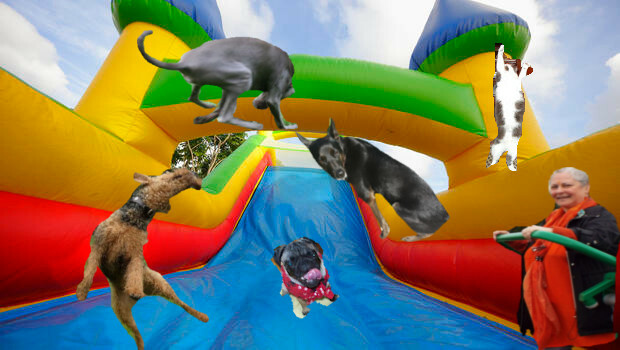 OMD, look at Mabel slide! Tegan and Angus are waiting patiently in line while Jessie snoopervises. But look up on the roof -- Chimera didn't want to wait for her turn! Here's another of the houses! Lightning is waiting his turn while Yin and Yang play jumping on and off the slide! What a grreat time! Look at Jakey getting some air! Abby Lab took a break from her catering truck, and it looks like she's in a jumping contest with Hazel. Scylla looks ready to catch Jakey, and Fenris is bouncing everyone in the air! OMD, I think we definitely found the acrobatic group! Look at that hang time! Way to go, Madi! Hailey is getting some good air. Not to be outdone by his teacher, da Phenny is trying the complicated triple roll. Oh wow! I hope he doesn't land on Maggie Mae. Wyatt is jumping like he just doesn't care. And look -- YamAunty brought her special jumping harness and is joining right in! This house seems to be a little easier, but we've still got some grreat jumpers! Blogville's newest resident, Timber, is getting some practice under the watchful eye of big sister Misty. Phod and Riley are really getting some air! And WHOA! Do you see Stella Rose?? She's done a complete flip mid-air! I hope she doesn't land on Timber. BOL! 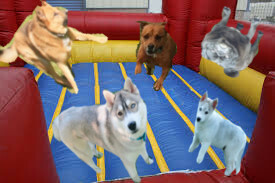 Finally, I have a very SPECIAL bouncey house here that's only fur the very BRAVEST. So be warned, the faint of heart need not come by!! 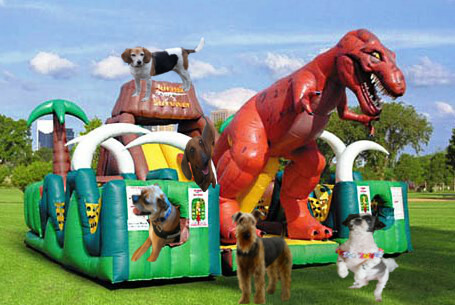 OMD, just look at Arty standing up to Mr. T-rex! And -- is Christmas PEEING on him!?!? Wow, now THAT'S bravery! Ruby is the bravest of all, standing up without any concern for the roaring behind her. (Oh, I see Murphy watching her in the distance. BOL!) And wow, look at Tuiren -- he's King of the Dino Mountain!! I'm so proud of all my brave furiends. Thanks fur coming out to the bouncey houses, everyone! Feel free to try your favorite houses. We're open all day, until it's time for the barn dance! Enjoy the rest of the picnic! Today be International Talk Like a Pirate Day! So heave to, ye sea dogs, or Long John Casey'll send ye to Davy Jones' Locker! LBR supporters rock the house!! OMD, you guys! Jessie and I are SO excited! LBR set an ambitious goal of raising $25,000 for North Texas Giving Day yesterday. At the end of the day, our total was $26,425!!!! Thanks to all of you who donated, and ALL LBR's fans and supporters! Today is North Texas Giving Day! That's a pawesome day for charities in North Texas to compete to see who can raise the most funds. In addition to the donations, NTXGD adds prizes for charities who raise the most money, have the most donors, etc. If you'd like to pawticipate, go to LBR's page on the North Texas Giving Day website and donate! All the boxers that LBR has helped -- like me, Jessie, my angel sissy Cinderella, and all our foster siblings over the years -- say THANK YOU!!! LBR's fundraiser to help rescues affected by Hurricane Harvey has been a HUGE success! We raised $5,510 in profit to send to Austin Boxer Rescue and Lone Star Boxer Rescue. Thanks to all who pawticipated! The pawesome folks at LBR have come up with another way to help us help our fellow Texas boxers affected by Hurricane Harvey. Is that cool drool or what? 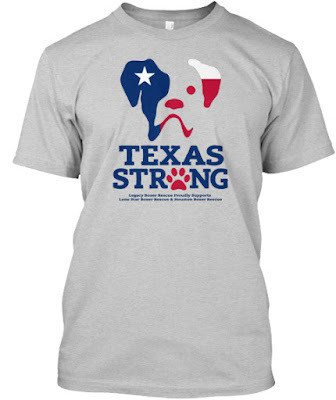 And the best pawt -- 100% of the proceeds will be split between Austin Boxer Rescue and Lone Star Boxer Rescue in Houston to help support them as they recover from Harvey and help animals that were displaced from the storm. 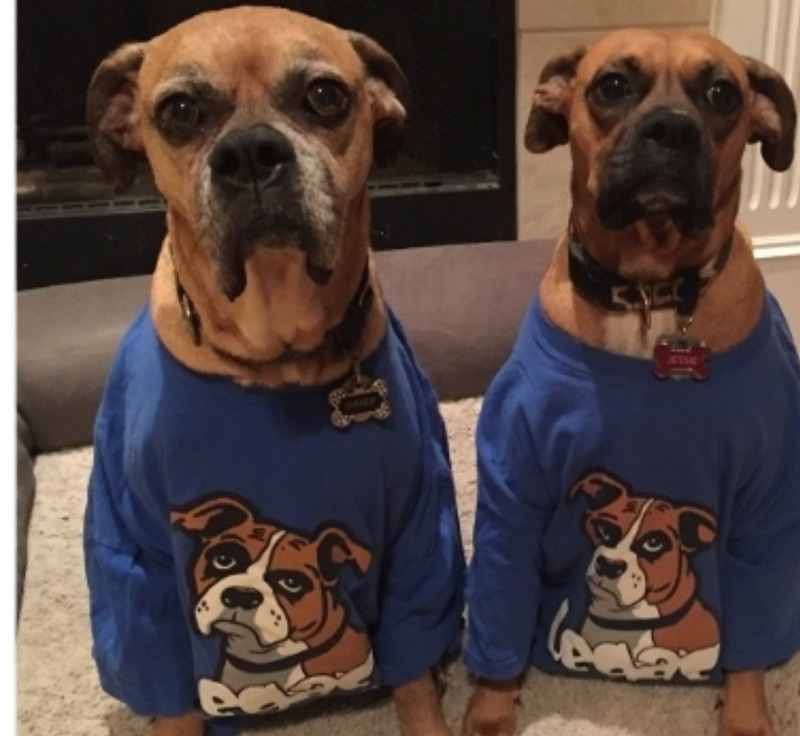 You can go HERE to order your own shirt -- it comes in a couple of different colors, lots of size options, and a whole bunch of choices like long sleeves, sweatshirts, and kids sizes! 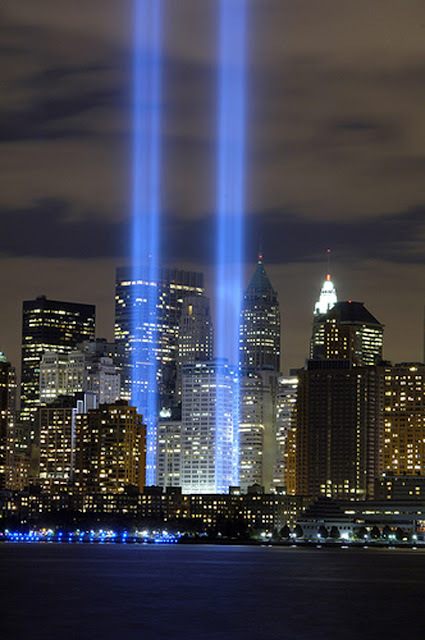 Stay Texas Strong! 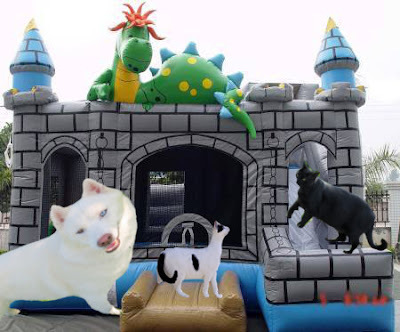 PeeS: Don't furget that if you want to jump in our bouncy houses at the LBR picnic, you need to get your pictures in by TONIGHT! Email them (jumping or standing shots please) to dreagoddess(at)gmail(dot)com. If you've emailed us and haven't gotten an email back, please shout and let us know! Yesterday I had my regular checkup with my heart dogtor to see if my arrhythmia is doing okay under the meds. Can you guess how it went? Yup, Momma and I are both beaming, because everything was pawfect! Not a single blip on the screen. Hooray! We'll keep at this level of meds, and I don't have to get checked again for TWO whole months! Momma also saw her dogtor yesterday, but she's not as happy about it. She has been having a lot of trouble with her paws and had to go to a pawdiatrist to have them checked out. She has lots of long words wrong with them, but she has lots of exercises and stuff to do to try to make them better. She's not sure at this point if she can run her next marathon, which is in only a month, so that has her really upset. Pigeon worked super hard to comfort her yesterday, and Jessie and I are SUPER helpful and give her kisses while she does her stretches! Hopefully it'll work out. 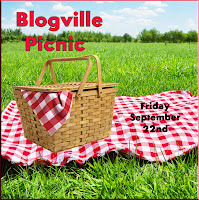 Finally, please remember that the dead lion is TOMORROW for jumping in our bouncy house at the Blogville Picnic! 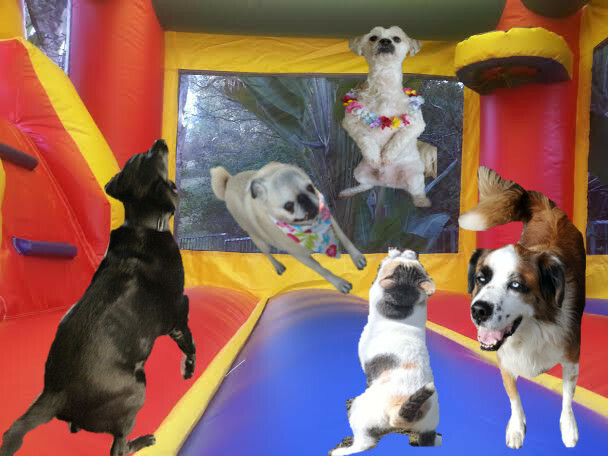 Email a pic of you jumping or standing to dreagoddess(at)gmail(dot)com if you'd like to pawticipate. Momma and I hope you had a grreat long weekend spent with the folks you love most. 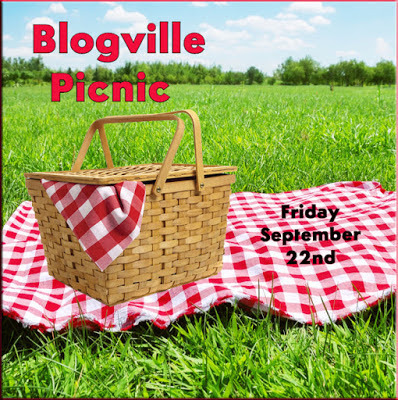 If you wants to jump in one of our bouncy houses at the Blogville Picnic, send us a picture of you jumping or standing at dreagoddess(at)gmail(dot)com. The dead lion is this Friday, September 8th!